As for the moment, Olympus OMD EM5 is more expensive than Olympus OMD EM10, and the price gap is still quite significant, more than just one hundred bucks. But this does not rule out the possibility of Olympus OMD EM5’s price drop in the future, considering that it is somehow less popular than Olympus OMD EM10. These models share some similarities in their layouts, though they are indeed physically different from each other. They both can be a nice choice of budget mirrorless digital camera, but which one should you choose? Let us see the similarities and each model’s strong points! – Both models are armed with touchscreens for easy and neat control. The touchscreen is also tiltable and rotatable. With the articulating screen, you will be able to shoot from more flexible positions. – Both models come with electronic viewfinder, so they have decent framing and control. They also have sensor-shift image stabilization for clearer, sharper, more precise images despite camera movements. – Each of them has an external flash shoe that you can utilize to install a flash. This is a good feature for providing a good lighting to your photo object. – Both models come with face detection focus, RAW support, and AE Bracketing. – Each of them is armed with 16MP Four Thirds CMOS sensor with 3-axis sensor shift image stabilization. They record vids in 1080p at 30fps. Even though being more expensive, Olympus OMD EM5 only comes with a handful of strong points. Nevertheless, these key features may be beneficial for some people. – Olympus OMD EM5 has a rugged, weatherproof body. With its environmental sealing, you can use it under bad weathers and tough conditions without breaking it. Olympus OMD EM10 does not have this feature. – Olympus OMD EM5 has a microphone port, which Olympus OMD EM10 lacks. This feature is more useful for people who use their cameras for video recording. With a mic port, you will be able to record better audio. This is not needed if you use your camera for photo only. 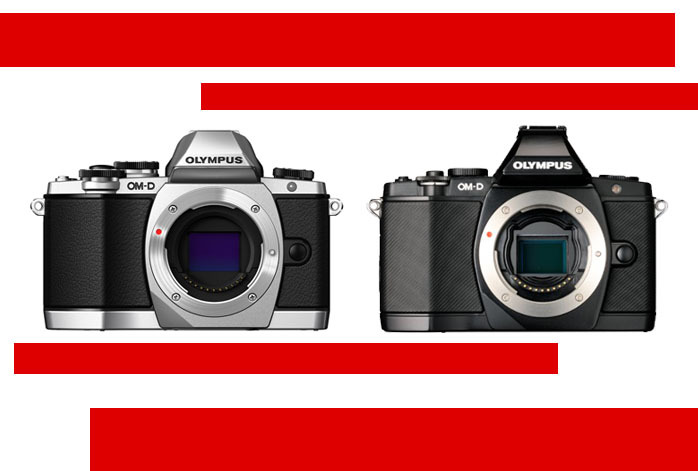 – Olympus OMD EM5 has a slightly faster photo burst feature than Olympus OMD EM10 (9fps vs. 8fps). Nevertheless, both models can be considered fast enough for continuous shooting. For most people, Olympus OMD EM10 can be more powerful than Olympus OMD EM5. – Olympus OMD EM10 has built-in Wi-Fi connectivity, so it can transfer files much more easily. – While both models come with external flash shoes, only Olympus OMD EM10 that comes with built-in flash. Thus, you won’t have to spend extra bucks for getting a flash accessory, and having a flash feature always ready is more convenient. – Olympus OMD EM10 has more focus points than Olympus OMD EM5, so it can capture more details. Its image quality can be sharper and clearer. – Olympus OMD EM10 supports time-lapse recording. Olympus OMD EM5 does not. – Its LCD screen has a higher resolution than the other contender, so the image preview can be more accurate. Considering that Olympus OMD EM10 is cheaper and coming with more advantages, in general, Olympus OMD EM10 is the better way to go! Its photo quality is higher, and the Wi-Fi connectivity is especially practical. Olympus OMD EM5 is only viable if you use your camera more for videos, as the mic port can be crucial here.